The one with all the horribly dated CGI. 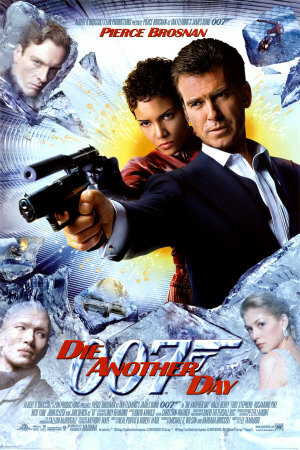 Die Another Day is the logical (but nonetheless unfortunate) conclusion of the path the Pierce Brosnan Bonds have been on since GoldenEye. After the played out Cold War politics of the early Bonds, there was a changing of the guard at EON Productios. After a five year break, the studio started putting out films that tackled a different thematic issue: technology. But where GoldenEye and Tomorrow Never Dies painted a balanced portrait of technology as a tool whose ethical value is determined by its user, Die Another Day represents the mindless acceptance of technology as the only feasible strategy in the new world order. Embrace our mechanical overlords! The difference here is small but crucial. Both sides of the conflict use technology in all of these movies, but in the first two there is a clear distinction between the way each side uses it. MI6 use GPS as a safety net to protect Bond, Carver uses it to broadcast his insidious propaganda. In Die Another Day, this contrast is turned into a direct parallel. The good guys are just as violent with their technology as the bad guys, and where Tomorrow Never Dies critically examined political ideology, here the film openly embraces the antagonism between Britain and North Korea. There no longer remains any difference between MI6 and their corrupt nemesis. Bond himself becomes the real villain. True national propaganda. This culminates in what is simply the dumbest scene in the entire James Bond franchise. I hate this criticism that a movie is "stupid" because it's presumptuous on the part of the critic and demeaning to the filmmakers, but there's just no other way to describe it. The central antagonist Mr. Bad Guy shows off his space laser to the North Korean military leadership, and the general challenges him by name-dropping Sun Tzu. Mr. Bad Guy responds, "I remember my Art of War, and this [the space laser] is what guarantees that victory." Later, Halle Berry stabs someone with a book. Which book? Sun Tzu's The Art of War. Ugh. Structurally, Die Another Day runs into a lot of the same problems as The World Is Not Enough. The tether between action and narrative which grounds the spectacle of the set pieces threatens to snap at any minute. And this movie has the added problem of relying too heavily on instantly dated digital special effects. Pierce Brosnan windsurfing the tidal wave created by a melting glacier is such a laughable image not only because of the ridiculous action or the idiotic global warming joke it inspires, but also because the seams of the effect are so bare that there's no way to properly immerse yourself in the scene. If the rest of the film were working as a comedy then this might have been a great climax, but instead it deflates what ought to be the most exciting scene in the movie. I'll admit that I kind of like the hovercraft fight scene at the beginning of the film, and John Cleese does a pretty serviceable Desmond Llewelyn impression, but after that there's almost nothing in Die Another Day that I get any sort of enjoyment out of. Even watching this with my lovely girlfriend, who manages to bring light to the darkest of corners, I found the film barely tolerable. My one solace is that now I get to finally move on to the Daniel Craig Bonds, which are some of my absolute favorites in the entire series.